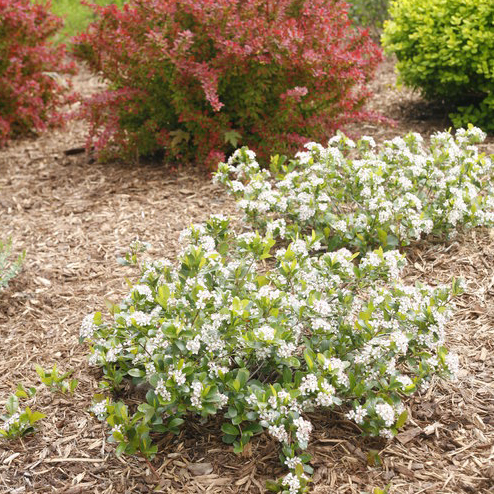 If you live in USDA zone 5 or even 6, you may not be familiar with abelia, as many varieties of this popular landscaping shrub aren’t very cold tolerant. 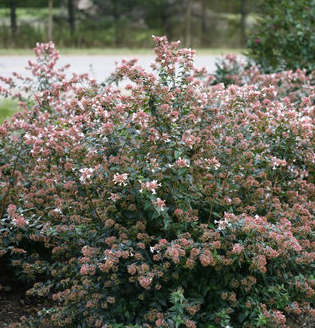 Ruby Anniversary abelia, however, is hardy all the way to zone 5, expanding the range for this versatile, beautiful species. Very fragrant, trumpet-shaped white flowers draw mobs of butterflies and hummingbirds to it, but there are two features that make it especially useful as a pollinator plant: 1) it blooms late summer through mid-autumn, providing nectar at a time when migrating pollinators, in particular, need to load up on food and 2) it blooms for a very long time, making it a reliable source of sustenance. People tend to associate pollinators with summertime, when it seems every plant is abuzz with insect activity. However, spring is a crucial time for insects as well, as those that migrate or awaken from dormancy are hungry for a good meal. Low Scape Mound aronia is covered in nectar-rich white flowers in mid-late spring so makes the perfect “breakfast” for pollinators. Each is dotted with a crown of pink pollen, making it all the more enticing to gardeners and pollinators alike. In late summer, dark purple berries develop, attracting birds and other wildlife. This native shrub was selected for its low, dwarf habit, allowing aronia to be planted in areas it could never grace in its conventional large form. It’s a pollinator plant anyone has room for! Vanilla Spice Clethra comes by its common name of summersweet earnestly – at the height of the season, when it is in bloom, its fragrance will stop you in your tracks. It also attracts lots of pollinating insects and hummingbirds, who are lured in by its spicy-sweet, almost root beer-like fragrance. 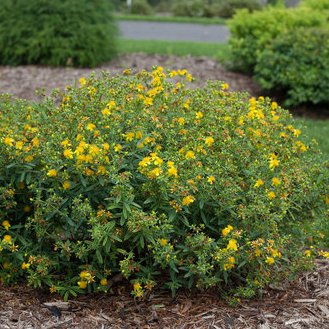 While pollinators are most attracted to plants in the sun, summersweet is one of the most shade tolerant plants we offer so even those without a lot of bright sun can enjoy the flowers, fragrance, and glowing yellow fall color of this easy-going native shrub. Never heard of Heptacodium, also known as seven-son flower? 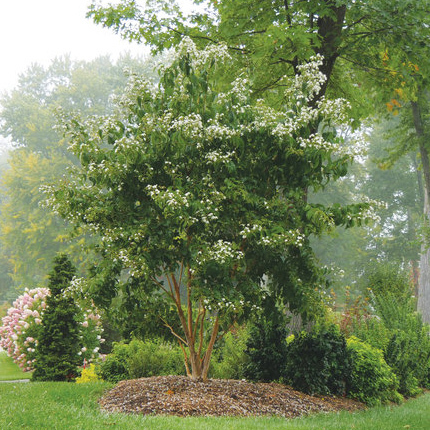 You’re not alone, but this outstanding large shrub/small tree deserves to be better known. With exceedingly handsome foliage and a dramatic silhouette made even more so by its peeling bark, Temple of Bloom Heptacodium brings beauty to all four seasons. 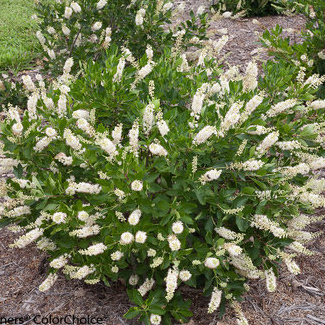 But its hundreds of fragrant white flowers in late summer are what make this plant of special interest to bees, butterflies, and particularly to hummingbirds, which have often nested in the specimen in our trial gardens. After the flowers drop, the bracts that held them develop a bright cherry-red color for a flashy fall display. Temple of Bloom blooms earlier than conventional Heptacodium so even if cold temperatures arrive early, you’ll enjoy a good show. The big, satellite dish-like flowers that make rose of Sharon so popular with people also make them attractive to pollinators. If you grow them, you’ve no doubt been treated to the sight of a bumblebee so heavy-laden with pollen that it can barely fly away from the flower. They’re favorite of hummingbirds, too – fortunately, the long bloom time and very heavy bloom set ensure there’s plenty of nectar and pollen for all visitors. You can take your pick from any of our beautiful varieties, but Orchid Satin® seems to be a pollinator favorite, thanks to its deep red eye in the center. 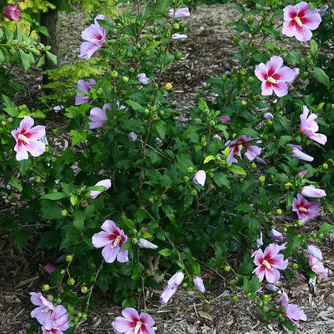 *If you live in USDA zone 4 and can’t grow rose of Sharon, try a perennial hibiscus like the Summerific® series. Hydrangeas are not the first plant most folks think of when it comes to pollinator plants, but the fact is the lacecap varieties like Pinky Winky, which display their nectar and pollen rich fertile florets prominently, bring in the buzz in a big way. Plus, Pinky Winky is an easy-care panicle hydrangea, which are practically foolproof and can be easily grown in both hot and cold climates. Though the mophead varieties – the ones that form the big, full, fluffy flower heads - are usually considered showier, looking for lacecap varieties ensures you’re doing something good for pollinators as well as beautifying your landscape. 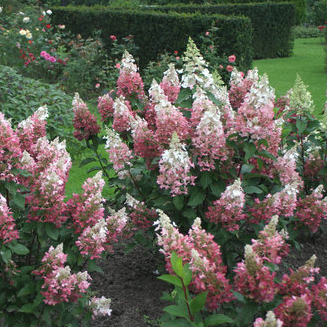 Like Pinky Winky hydrangea above, Gatsby Pink has lacecap flowers that attract pollinators. 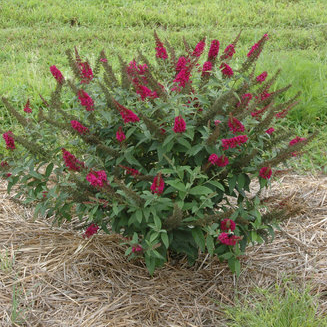 It emits a sweet, honey-like fragrance that carries on the warm summer breeze, and those big, showy blooms take on a glorious deep pink color as they age. This North American native welcomes all sorts of wildlife: the wooly hairs on the emerging leaves can be harvested by insects and birds for nesting material, as can the peeling bark in winter, which also provides cozy spots for pollinating insects to spend their dormant season. 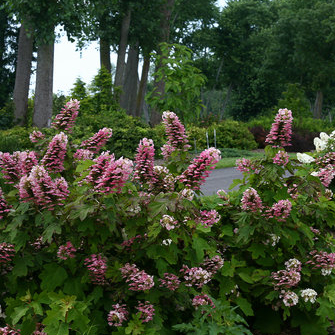 Unlike other oakleaf hydrangeas, Gatsby Pink continues to create fresh new flowers through fall, extending its appeal to pollinators by several weeks. Want to see what a happy bee looks like? Plant Blues Festival St. John’s-wort and watch them celebrate. This long-blooming native shrub is covered in bright yellow sunburst-like flowers in summer that bees adore. The cheery yellow blooms and the happy, buzzing bees seem made for each other! Blues Festival was developed for a long bloom time as well as deep blue foliage, which makes it a handsome landscape accent well beyond its bloom time. There’s so much blooming in spring that it would be easy to overlook the bees and butterflies that visit lilac then. 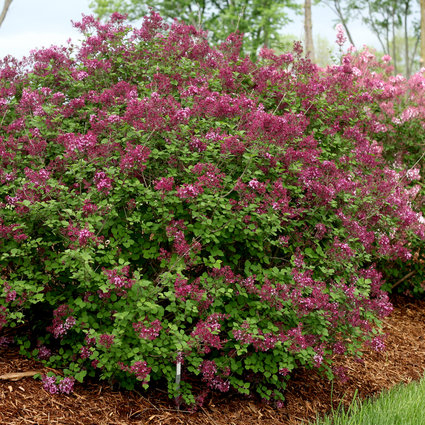 But with a reblooming lilac like Bloomerang Dark Purple, which blooms in spring along with other varieties then comes back with waves of fresh flowers in summer and fall, you’re sure to notice them sooner or later. These additional blooms are especially popular with butterflies, expanding the offerings at the garden’s buffet. Watch these plants and their pollinators in action in our video! Learn about annuals and perennials that attract pollinators.